Since 1951, Coastal Center for Developmental Services has been an organization whose purpose is to empower people with developmental disabilities to live the fullest life possible through advocacy, inclusion, training, and meaningful employment. Over the years, CCDS has earned a reputation within the state for being a leader and an innovator, developing programs that are many times are then implemented state-wide, benefiting thousands of Georgians with developmental disabilities. We have long led the way in empowering people with developmental disabilities, even before the mandate to do so was handed down from government officials. In basic terms, with the Olmstead Act, the Supreme Court and Americans with Disabilities Act (ADA) said it is illegal to isolate and discriminate against people with disabilities, a perspective that CCDS has embraced since its inception. Until the Olmstead Act, which interpreted Title II of the ADA to require states to place people with developmental disabilities into community-based settings whenever possible, was passed by the Supreme Court in 1999, people with disabilities were often institutionalized as a first option, without regard to what they could offer the greater community. Still, people with developmental disabilities remain a population that society struggles to relate to and acknowledge, even though these wonderful people are someone’s family member, friend, or coworker. 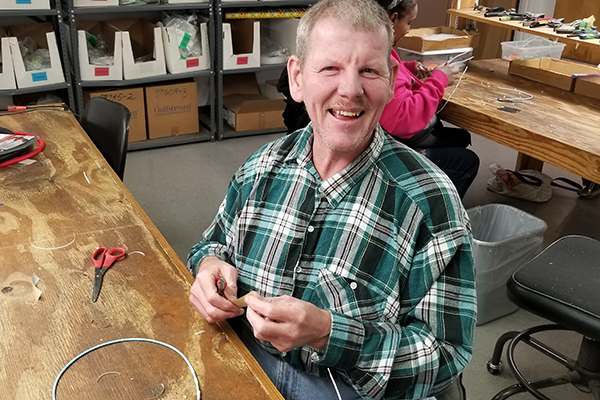 While it’s easy to agree that embracing people with disabilities to be part of the community is beneficial to all, one of the biggest obstacles CCDS faces is turning that belief into job opportunities. Undeterred, CCDS continues to advocate for, train, and support individuals with developmental disabilities to help them to find the enrichment and the engagement opportunities that give their lives more meaning, and the job skills that allow them to be fully integrated into the workforce and woven into the fabric of our community. This continued focus on people’s abilities, rather than their disabilities, is why, after more than two decades of being known as Coastal Center for Developmental Services, we have begun a transformation and will be changing our name to more accurately state our mission of full integration and assimilation into society for those people with developmental or intellectual disabilities. Our staff and board of directors are hard at work developing a name and a new identity that puts the people we serve in the forefront every time we say our name. Our new name will emphasize that all people have abilities, and with this new name we renew our commitment to create value and visibility for the people we serve. Please continue to follow our progress in the coming weeks and months, as we endeavor to touch more hearts, change more minds, and make more opportunities for people we serve. Your support for this important work helps to empower people who want the chance to grow, learn, and make a difference.